Bali Museum was opened in 1932. 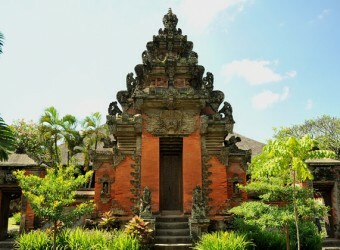 The museum building is separated into 4 parts, and there are various exhibitions that show Balinese original religion and culture. In the biggest building, there are the exhibitions of religious ceremony, the door with great wood curving, and antique statues of Hindu Gods, etc. that are worth seeing. Shadow puppet show is the most interesting. When I watched Bali local TV at the hotel, shadow puppet show was played. I heard from guide that puppet shadow is comedy. If I have the chance I want to see it.